Synopsis: The dramatic lives of trapeze artists, a clown, and an elephant trainer against a background of circus spectacle. Did You Know? 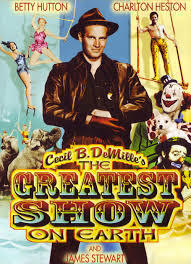 Cecille B. DeMille was very insistent that his actors really learn to perform the circus stunts their characters performed. So, Betty Hutton learned the trapeze, and Gloria Grahame had to let an elephant rest its foot an inch from her face. Possibly worse-off was poor Cornel Wilde, who was deathly afraid of heights and had to learn the hire-wire. Oh hey, Jimmy Stewart is playing a clown, maybe it won’t be so ba… Oh… nope. He’s a murderer… He killed a woman because “he loved her.” Ugh. This one might just be the most sexist, womanizing, misogynistic film in my marathon yet. This is definitely not my favourite Best Picture winner. There were only two things about this movie that I liked: 1) the extravagant purple and pink costumes during the promenade scene and 2) Betty Hutton’s death-defying and gender-stereotype-defying Holly the trapeze artist. It’s really no wonder that this is regarded as the least-worthy Best Picture winner by many critics.